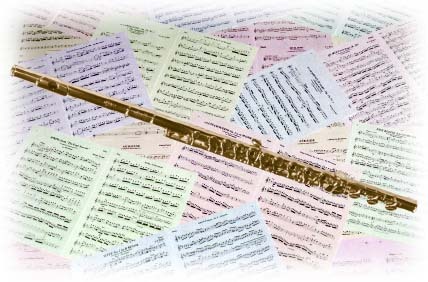 In addition to the series Flute Solos with Full Orchestral Accompaniment using SmartMusic and Chamber Music Flute Solos with Full Accompaniment using SmartMusic, there are three other series of Flute Solos which come with Full Orchestral Accompaniment. - an Audio CD containing the accompaniment (both the full orchestral and piano) at various speeds, in addition to the practice examples at varying speeds (e. g., repeated several times with the metronome speed increasing on each repetition). In the works by Bach or Telemann, Harpsichord & Cello is used instead of Full Orchestra. In addition to preparing for Conservatory exams, the Exam Preparation Kits are very useful as solos for the end of Semester, Music Festivals or Competitions. The number and letter (e. g., 4a, 8b, etc.) indicate the difficulty level suggested by some Canadian conservatories.